As I bird, walk the dog or run errands, puffs of white float down on the breeze. Up on Higgins near the book store it’s just the occasional bit of fairy floss angling down across my vision. Near the river it’s a blizzard, complete with drifts on the sides of the path and white flotillas on the water. 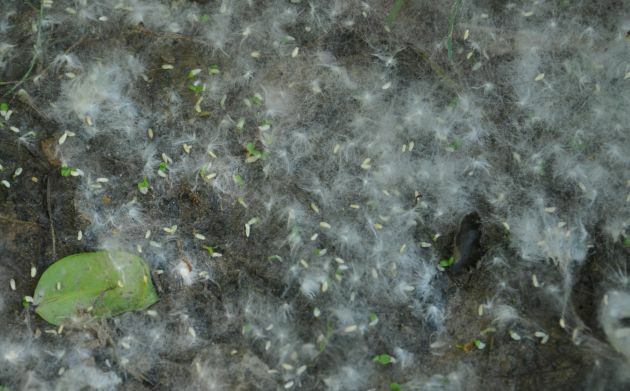 The cottonwoods, a division in the larger clan of poplars, are named for these unmissable seeds. 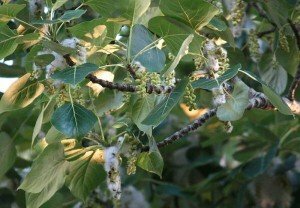 The species that calls western Montana home is the black cottonwood, while plains and narrowleaf cottonwood call the rest of the state home. Taken together, they are one of the most familiar trees of Montana’s riparian areas, and given the richness of those riparian areas, one of the most vital for birds as well – some half of Montana’s bird species use cottonwoods as habitat at some point during the year. They can grow large and magnificent, providing trunks large enough for dug-out canoes and building materials along with medicine and other practical uses from their buds and bark. The are strong, they are important. They shelter and shade, feed and bind. Despite this, they are in some ways quite fragile. Those seeds, borne aloft on a tenuous parachute of white fibers, are of necessity small and delicate. They have only a brief window to find the right spot to send down roots – a spot with the combination of moisture, sunlight, and fine silty soil they need. This is usually in the flood zone of a river or meandering stream, so they must avoid being washed away by high water levels and then send down roots quickly in pursuit of lowering ones. Then, as they grow, they must avoid being grazed – young cottonwoods are very popular with both cattle and wild browsers – or burnt – for they do not have the robust fire-endurance that many of Montana’s upland tree species do. Each of the seeds that blows by me, in short, has not much more of a chance than an actual snowflake. Humans have not helped. Damming and flood control are the big issues – where there are no rising and retreating waters in the spring, there are no fresh, damp, silty flats suitable for the snow of seeds to land upon. Letting cattle trample upon the riverbanks, or promoting game animals and eliminating predators until the populations of elk and deer munch the stream-sides bare, also cut back on the replacement rate of the big trees. And like any native plants they face scourges in the form of development and the introduction of invasives. The result is a slow retreat of the cottonwoods, not readily noticed by a human with a human lifespan and attention-span unless we know what to look for. A gap comes when a large tree falls, but the true problem is a lack of small trees coming up behind it. A lack of chances, unless we preserve them, for snowflakes. Where Are You Birding This Fourth Weekend of June 2014?